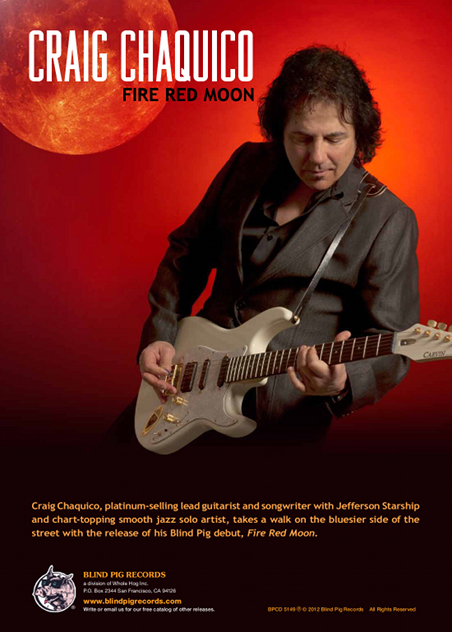 October 03, 2013 08:01 ET | Source: Beamz Interactive, Inc.
Beamz Interactive is pleased to announce that former Jefferson Starship member and current new-age/jazz guitarist, Craig Chaquico -- a Beamz supporter since 2011 -- is opening the 2013 Catalina Island JazzTrax Festival. SCOTTSDALE, AZ--(Marketwired - Oct 3, 2013) - Beamz Interactive, Inc. (OTCQB: BZIC), an emerging growth technology company specializing in state-of-the-art interactive music products, is pleased to announce that former Jefferson Starship member and current new-age/jazz guitarist, Craig Chaquico -- a Beamz supporter since 2011 -- is opening the 2013 Catalina Island JazzTrax Festival tonight, October 3rd, on Catalina Island, 26 miles off the shores of Southern California. The 27th Annual Catalina Island JazzTrax Festival, is one of the west coast's foremost fall music events and each year assembles a talented roster of all-star players such as Craig Chaquico. Chaquico is an original founding member of Jefferson Starship and Starship, and is the only band member and the only lead guitar player that played on every single album, hit song, tour, and video of the real band when it was still making hits. He was the one single continuous member on all the hits from 1974 through 1990. "We're so proud to have our Beamz in the hands of such an accomplished and professional musician," said Charlie Mollo, CEO of Beamz Interactive. "It's amazing to see the exciting way Craig incorporates the Beamz into his performances. He has been using Beamz for several years now, so we're looking forward to introducing him to the latest Beamz by Flo and letting him see the improvements and upgrades we've made to our new product line. We think Craig and anyone else who's played the Beamz will realize they're experiencing the future of interactive music, and something unlike any other modern musical instrument." Guitarist Craig Chaquico commented, "The Catalina Jazz Festival is something I've enjoyed being a part of ever since I first visited the island back in 1995, and it just seems to grow on me each year. Being asked to play on opening night, under the stars on Descanso Beach, is an amazing thrill. Over the years I've been able to integrate playing the Beamz with my performance, adding an exciting visual dimension to my shows. More recently I've been inviting audience members up to the stage to give them a shot at playing the Beamz. It's incredible to see people with little or no musical experience making something beautiful. Whether you're an old rock and roll guy like me, or just a novice player feeling it for the first time, it's an incredible experience." In a recent interview, Chaquico was heard discussing his rock to new-age influences, and also how he's seen the Beamz grow on him, and how it helps him present his music so people listening are hearing the same harmonies that he wants them to hear. Chaquico stated, "With a device like Beamz, it reminds me of the early days and being in a studio with Jerry Garcia, Paul Kantner and others, and seeing our first Moog synthesizer. It changed everything..."
Chaquico concluded, "That's the kind of excitement I get when working with something like the Beamz. It really is that progressive, and can really be an agent for change in how music is played, recorded and interpreted as well as how others can play along to pre-recorded tracks, and also create their own new mixes for songs being played by their idols. It lets me bring elements to my music I could only imagine before, and it gives it a whole new dimension." Craig Chaquico (cha-KEE-so) has engaged and inspired generations of pop music fans, first as an original founding member and the only lead guitar player and principal songwriter for both the multi-platinum Jefferson Starship and Starship bands during the '70s, '80s, and all the way till the band split up in 1990 and stopped recording. Earning 20 Gold records with Jefferson Starship and Starship as an original founding member, lead guitarists, co-producer and songwriter, Chaquico was instrumental in making them one of the most successful bands in rock history. In the 1990s, after finding himself already at the top of the national charts in 3 consecutive decades, Craig left the fast-paced rock world and reinvented himself as an award winning, #1, Grammy-nominated, million-plus selling solo jazz/new-age artist, songwriter, producer, and band leader. With his own #1s in BILLBOARD and in recognition for his CDs and songs he was voted GuitarPlayer Magazine Readers' Poll Winner for Best Pop Instrumental Guitarist and listed in Jazziz Magazine as one of the Top 100 Most Influential Guitarists of All Time. For more info visit: www.craigchaquico.com.